Every B2B business would love to triple their leads in 2017 right? So the question is how to do it. As a data provider we know that anyone who is serious about increasing their leads needs to start with a strong foundation of solid data. So what do we mean by solid data? Firstly your data needs to match your market. In order to generate leads your list must be relevant to your business. It might have been relevant when you bought or created it 5 years ago, but is it relevant now? What’s more, could it be improved? It might broadly map your market but quality data using analytical software can go much deeper than that. You will also increase your leads by making sure your database is up to date. People and businesses move and key people change job roles. If your emails and mailouts aren’t reaching the right people there is zero chance of generating business. Getting accurate contact details will explode your results. So if you want to increase your business leads this year it’s worth going back to basics and doing a data audit. Whether you want your data cleansing or you’re interested in a new, targeted list of contacts, we can help. Why should you use direct marketing - in the new age of social media and digital marketing some businesses may think there’s no need for direct marketing techniques. Isn’t it enough to promote a website using Google AdWords or advertise to generalised audiences on social media? The answer for many marketers is a resounding no. Not to use direct marketing is missing out on a golden opportunity to target particular people (either existing or potential customers) with a personalised message about your product or service. Direct marketing utilises a variety of combinable channels (direct mail download ‘why it’s here to stay’, telephone and email marketing), and at the heart of any well structured campaign is a good database. Social media marketing, digital display advertising and search engine marketing uses different methods (such as demographics, location and interests) to select which audience your advert will appear to. Not only does direct marketing allow your business to contact a database of people directly and track their response rate, it can also make your business stand out in our new digital age. The widespread use of the internet and smartphones has made many businesses lazy about using direct mail, leafleting and telephone marketing, but these ‘old school’ methods of marketing are just as important as ever and can be even more effective as more and more businesses switch to digital. The widespread popularity of social media has also made some businesses think that email marketing is unnecessary. Again, there is no replacement for sending a targeted email directly to a customer’s inbox and tracking their open rate, responsiveness and actions. A one-to-one connection with a customer or potential customer cannot be replaced by pop-up digital ads, search engine ads and social media newsfeed ads. Direct marketing lists can also improve the targeting capabilities of social media campaigns. For example, Facebook allows you to upload customer databases and then target those customers with adverts. This new way of using direct marketing data makes it just as important as ever to keep on top of your direct marketing lists. A quality database is critical to any good direct marketing strategy. So make sure your business data is up to date, accurate and clean. Contact Corpdata for advice on acquiring or cleaning marketing data. Your best marketing list helps you get your message in front of the right decision maker in the correct organisation. The more focused your list is on the ‘right’ people the better your return and less time and money you waste. 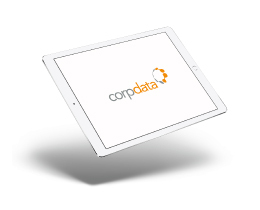 Corpdata FOCUS files help you really do just that. Fleet Focus - connects you to UK fleet and other decision makers and lets you identify your best prospects using vehicles and fleet size, the number of cars, vans, lorries, motorbikes, plant, taxis and even buses. IT Focus provides an in-depth analysis of IT hardware and software used on site, which can include the number of PC’s used to the type of accounts software used. Recognised as the definitive guide to UK organisational IT deployment, and so able to identify IT users with a qualified interest in your products and services. Telecom Focus is an invaluable guide for anyone marketing in the telecoms industry, boasting coverage of the telecoms infrastructure of many of the UK’s largest telecoms users including size of installation, technologies used and telecoms spend. size to types of work carried out, and also offers call centre and customer service decision maker contact information. Online Focus uses simple classifications of the online footprint of companies, combining their industry sector, geography, and size, and other telephone researched detail to offer a unique list for those who seek to target on line activity. communications touch the right people. BUT should you also use what you already have? It can be a real dilemma. Many organisations have large pools of legacy data which they feel is too valuable to discard but too poor to use. Not mentioning the potential costs, both financial and reputational, of using a marketing list that has passed its use by date. It really is a sensible idea to invest in good, valid and safe information for your marketing campaign, and this may include refreshing the data you already hold. Your mailing list is a significant element in the cost of your campaign, but get this wrong and you will get a lower than you expected response rate. It really does pay to source a clean list, or to clean what you already have. Did you know that thousands of businesses change their address and postcode every month? Not only do a great many contacts go away from where you think they are but many thousands of companies register on either the MPS, CTPS, TPS or FPS. These changes do impact on the reliability of the list you already hold. You will benefit from a one off ‘spring’ clean or a more regular polish of the list you use. You’ll reduce the amount of wastage that inevitably occurs and your campaign will generate better results, be it engagement, customers or awareness of your business. Data Cleansing; what is it? When we clean someone’s list we correct or remove information that is either inaccurate or of poor quality. Information may be inaccurate for all sorts of reasons; often formatted or typed incorrectly or it may be that an address or phone number have changed, resulting in the erosion of the value of the out of date record. Regular cleansing of your mailing lists ensures that they will not only be safe to use, but that the quality and accuracy leads to improved response rates from potential customers. Contact us to see what’s possible, 01626 777400. If your business sells IT products and services to companies, and you’re looking to increase your sales this blog post is for you. Every business needs to generate targeted and relevant leads and if you haven’t purchased a data list before it’s an absolute must if you want to improve your return on investment in 2017. Corpdata’s IT Focus file incorporates some of the largest blue-chip organisations currently trading in the UK and provides an in-depth analysis of the IT scale of the opportunity for vendors. This enables you to target the largest users of IT, or those with specific requirements for your products. Increasingly though, customers are looking to Online Focus to offer more detailed understanding. Online Focus offers you a way to link those organisations trading online to their real world identity. Offering information about the 'online footprint' of organisations, together with in-depth information about technologies in use. 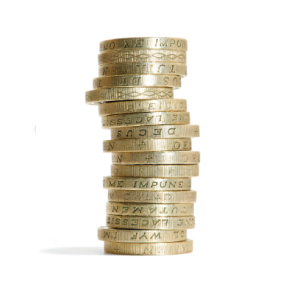 If you are offering products and services into organisations working in the online space, Online Focus will help you. Corpdata has built upon the success of IT Focus, to bring you a new, data product specifically designed to help businesses target the businesses of the future. If you want to generate sales to the biggest UK companies and you need the right business contacts look to our Stock Market 350 file. Packed full of over 1,500 of the most influential UK business contacts and giving you real choice to target your campaign. 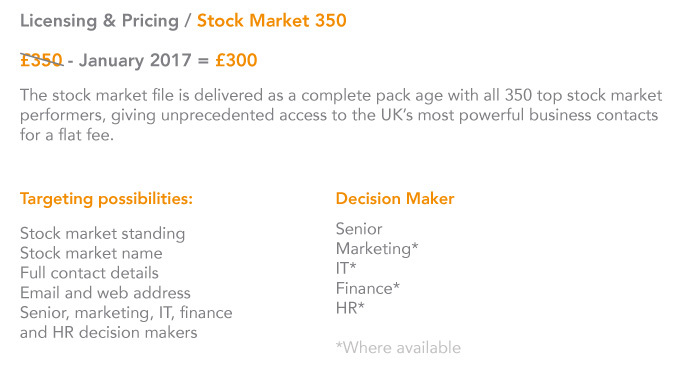 The Stock Market 350 file is built around the most significant companies listed on the London Stock Exchange and always details the senior decision maker and includes different decision maker contacts for Marketing, IT,Finance and HR where available. We research and update the file to provide you access to the most influential business contacts in the UKs largest companies and Stock Market 350 is structured and has detail which offers a plethora of targeting opportunities. You want sales… so do we which is why this January we are offering our full 12 month license of our Stock Market 350 file for only £300, saving you £50 almost 50 days use on US ! Accurate up to date and during January even better value. Consisting of the top 350 stock market performers, every record is supplied with the most senior decision maker at each company as standard, but we also include Marketing, IT, Finance and HR decision makers where available. This provides access to over 1,500 of the most powerful contracts in the UK’s largest companies. The biggest UK companies - The best marketing contacts.